I have recently bought a DSRL camera: Canon EOS 450D. Today it has shot for the first time to the stars. Beehive cluster was an easy target tonight. The maximum zoom the lens permits let us separate some of the components of the M44 cluster. The resulting image has been made of ten shots of 5 seconds of exposition each one. 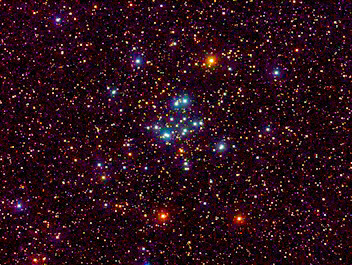 Praesepe, also known as M44 or the Beehive cluster is one of the brightest open clusters in northern sky. Visible with unaided eye, even in urban areas. I have applied some filters to enhance the picture, including an artificial diffraction mask to get spikes. Using the shift-and-add technique for 1 minute I got this result.